Venison is deep and rich and dark, more animal tasting than beef, ferric as blood. It is a lean meat and is thus best cooked quickly, just long enough to brown its outside while leaving its interior rare and tender. Little wonder it’s often matched with barrel-aged chocolate stouts or Belgian quadrupels; its uncommon intensity helps it stand up to the heavyweights. This time, though - rather than pairing two powerhouses - I wanted to find a beer that could help temper some of venison’s richness. Enter People Like Us, a collaboration between Gipsy Hill and the eponymous People Like Us, a Danish brewery run by people from marginalised groups. This bramble sour was brewed with raspberry, blackberry, and lingonberry purees, and pours a beguiling shade of magenta. It’s no accident that venison is commonly served with blackberries, drizzled in a redcurrant sauce or otherwise paired with berries; this is a meat that benefits from contrasting brightness and an added spark of acidity. Here, this beer isn’t just a pairing: it serves as an element of the dish that’s been outsourced to the glass, a stand-in for a reduction or glaze. The addition of fried sage leaves and vibrant sweet potato puree (infused with sage-scented brown butter) makes this a simple, wintry showstopper. 1. Roughly 45 minutes before you plan to cook, remove the venison steaks from the fridge and pat dry with paper towels. Season both sides generously with salt and pepper. Leave at room temperature so they won’t be fridge-cold when it comes time to cook them. 2. Meanwhile, bring a medium saucepan of salted water to the boil. Peel the sweet potato and finely dice. Add to the boiling water, along with the garlic cloves, and lower the heat to a simmer. Cook for roughly 12 minutes, or until the sweet potato is very soft but not yet falling apart. Drain and transfer the sweet potato and garlic to a food processor. 3. While the sweet potato is cooking, make the brown butter-fried sage leaves. Melt the butter in a medium frying pan, and add the sage leaves in a single layer. Cook for 4-5 minutes, swirling the pan frequently, until the butter has turned a deep brown, smells nutty, and the sage leaves are fried. Remove from the heat immediately, and leave to cool for a few minutes. 4. Transfer the sage leaves to a plate, and pour the sage-infused butter into a liquid cup measure (or other vessel with a pouring spout). 5. Season the sweet potato mixture with pepper and nutmeg before blending on high. As the food processor’s motor runs, pour in the brown butter in a steady stream. Blend until smooth. Taste and adjust the seasoning if needed. 6. Place a large frying pan over high heat. Once very hot, add the olive oil and swirl to coat the pan. Add the venison steaks and cook on the first side for approximately 1 ½ minutes, or until well browned. Flip and cook on the reverse for approximately 1 minute more (you can cook for slightly longer if you like, but venison is best served rare). Using tongs, sear off the sides of the steaks. Transfer to a cutting board and leave to rest for approximately 5 minutes. 7. Divide the sweet potato puree between two plates. Slice the venison steaks and place on top of the puree. Garnish with the fried sage leaves, and serve. I clearly remember the first time I tried Wiper and True’s Amber Ale. It was at Darjeeling Express in Soho – then a newly opened restaurant getting good buzz, now an upcoming star of Netflix’s Chef Table series – and it was served alongside a selection of some of the best curries I’ve ever eaten. To give credit where it’s due, fellow HB&B columnist Matt Curtis was the one who ordered the beer. At the time, I didn’t particularly gravitate towards amber ales. But after having a sip, I was struck by how adeptly this one worked with the heavily spiced, boldly flavoured dishes that we ate that afternoon. The notion that IPAs and other hop-centric beers should be served with spicy dishes is a strangely enduring piece of pairing advice. Unless you want a mouth full of flames, you’re actually much better off going with something cooling and malt-driven, something with enough sweetness to counteract the heat. This beer, for instance, which the brewery describes as “a full-bodied and sweet amber ale finished off with spicy, peppery rye malts”. It tastes irresistibly like caramel and is rich in the mouth, almost tongue-coating. This iteration is also hopped exclusively with Citra, which adds the subtlest, anchoring bitterness, as well as a light fruitiness. With that Darjeeling Express meal in mind, I decided to pair Wiper and True’s Amber with a chickpea and sweet potato curry. Hearty, complex and perfumed with autumnal spices like cardamom and cinnamon, this dish is made for crisp nights. Serve it alongside rice or a flatbread of your choosing (I went with flaky parathas) and top with a few verdant sprigs of coriander. 1. First, make the spice mix. Add all the ingredients to a ramekin or small bowl and mix to combine. Set aside. 2. To a food processor, add the ginger, garlic, chilli, the juice of half a lemon and a pinch of salt. Process until finely minced, or the mixture begins to form a paste. You can also do this using a mortar and pestle. Set aside. 3. To a large, heavy-bottomed frying pan, add the vegetable oil and place over medium-high heat. Once hot, add the mustard and cumin seeds. As soon as they start to pop, add the onions and stir to coat. Add a generous pinch of salt. Turn the heat down to medium-low – you don’t want the onions to scorch – and cook for 20-30 minutes, or until the onions are very soft and beginning to caramelise. 4. While the onions are cooking, peel the sweet potatoes and dice into roughly ½-inch cubes. Set aside. 5. When the onions are soft and beginning to turn golden, turn the heat to high and add the ginger and garlic mixture. Cook for approximately 1 minute, stirring frequently. Add the spice mix and cook for 30 seconds more, stirring constantly. Then, add the tinned tomatoes, chickpeas, the sweet potatoes, and 1 teaspoon of salt, stirring to evenly combine. Top with the water and stir to mix. 6. When the mixture begins to boil, turn the heat down to a simmer and cover. Cook for 20-30 minutes, stirring occasionally, until the sweet potatoes are just fork-tender. Remove the lid and turn the heat to high. Cook for roughly five more minutes, stirring frequently, until any excess liquid has evaporated and the curry has thickened. Season to taste and squeeze over the remaining lemon half. 7. To serve, divide between plates and garnish with coriander. Serve alongside rice or flatbread. Claire M. Bullen is a professional food and travel writer, a beerhound and an all-around lover of tasty things. Follow her on Twitter at @clairembullen. There is no shame in frozen puff pastry. Like croissants (like many baked goods, in fact), the store-bought stuff is so reliable, of such high quality, that attempting to make it from scratch has almost zero comparative advantages. I came to puff pastry late, which is ludicrous because there are few simpler ways to make sweet or savoury pastries that look (and taste) professional. Seriously: serve a tray of fruit tarts or I-just-whipped-up-these- perfectly-flaky-palmiers and your friends will be in awe of your culinary skills. Because we’re on the cusp of autumn, I opted to make simple, puff pastry pinwheels filled with pumpkin. For those who are wary of all things pumpkin spice, don’t fear: here, pureed pumpkin is cooked down with garlic and paprika and coriander, and topped with crumbled feta and mint before being rolled into the pastry. The result – decidedly savoury, and extremely moreish – should appease even the most hardened pumpkin skeptics. Pumpkin and sage is a classic autumnal pairing, and I decided to evoke it here by serving these puff pastry pinwheels with Crooked Stave’s Colorado Wild Sage Brett Saison. Brewed with lemongrass and white sage, this lightly tart, piquant beer is refreshing enough for end-of-summer drinking, though the sage – a classic cold-weather herb – evokes a pleasing seasonal shift. 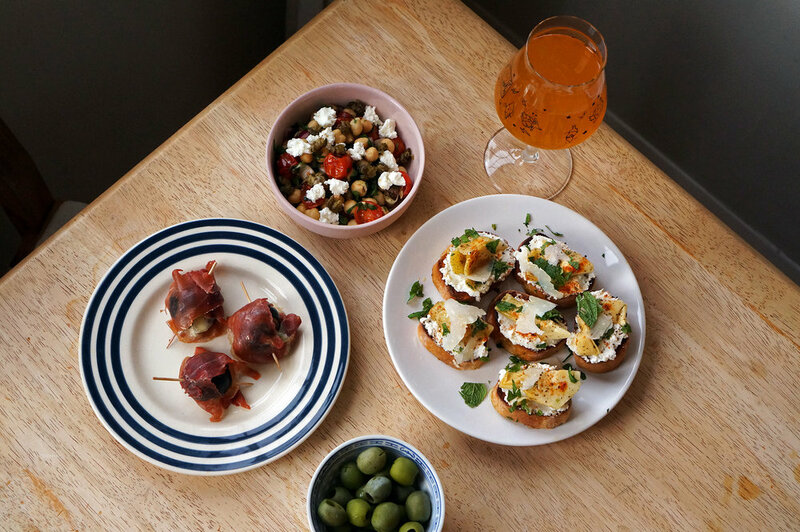 Together, this pairing couldn’t be more simpatico, whether you serve it as a boozy weekend brunch, as an appetiser, or simply as an anytime snack. 1. Several hours before you plan to bake, remove the puff pastry from the freezer and leave out at room temperature until completely thawed, approximately 3-4 hours. 2. Meanwhile, while the puff pastry is thawing, prepare the spiced pumpkin filling. Add all ingredients to a saucepan and place over medium-high heat. Cook, stirring frequently so it does not stick and burn, for approximately 20 minutes, or until the mixture is significantly reduced, thickened, and slightly darkened in colour. Remove from the heat and transfer to a bowl; cover and chill for approximately 45 minutes, or until cool. 3. Finely crumble the feta into a small bowl. Add the dried mint and mix through. Set aside. 4. Once the pastry is completely thawed, place on a sheet of parchment paper. Flour a rolling pin and roll the pastry out gently until it measures approximately 9” x 15”. Using a spatula, spread the pumpkin filling in an even layer across the pastry, leaving a small margin at the edges. Sprinkle the feta and mint mixture evenly on top. 5. With the pastry still on the parchment paper, and beginning from one of the long sides, roll tightly into a log. Wrap the log tightly in the parchment paper and transfer to the fridge. Chill for 30-45 minutes, or until firm. While the pastry is chilling, preheat the oven to 180° C (350° F). 6. Line a large baking sheet with another sheet of parchment paper. Remove the chilled pastry from the fridge and unwrap. In a small bowl, crack an egg and whisk until uniform. Brush the top of the puff pastry log with the egg wash, and sprinkle over the cumin seeds evenly. 7. Using a sharp, serrated knife, delicately slice the puff pastry log into approximately 1”- thick pieces (you will likely want to trim and discard the ends). Carefully transfer the slices to the baking sheet and arrange, leaving a 1” gap. Bake for 20 minutes, or until the pastries have puffed up, are deep golden, and the puff pastry in the centre of each slice no longer looks raw. Transfer to a wire rack and leave to cool for 10 minutes. You may need to bake your puff pastry pinwheels in two batches if they don’t all fit on one baking sheet. We have big news! We're delighted to finally reveal the forthcoming publication of our first book, The Beer Lover's Table: Seasonal Recipes & Modern Beer Pairings, written by our wonderful food writer Claire Bullen and HB&B co-founder Jen Ferguson. This book has been more than three years in the making - Claire first started writing her monthly food and beer column, The Beer Lover's Table, for us back in 2015 and we instantly knew it had the potential to be an incredible book. Over the past year, we've been working together to make this happen - a labour of love fuelled by the world's best beers and Claire's truly exquisite recipes. The Beer Lover's Table features 65 recipes and perfectly paired beer suggestions, along with insights into iconic beer styles, fantastic beer people and the wonderful craft beer scene, plus vibrant photography from our HB&B beer writer Matthew Curtis and others. It will be published by Dog n Bone in March 2019. We look forward to sharing more closer to publication. Late last year, while sheltering from a Philadelphia snowstorm, I ate the best falafel of my life. Incongruous, but true. The setting was Goldie — a restaurant which is owned by the Michelin-starred chef Michael Solomonov, but which itself is humble and small, easy enough to walk by without noticing. At Goldie, the falafel were only $7 and came tucked inside a still-warm pita, complete with all the fixings. They weren’t the dried hockey pucks that lurk in so many sorry wraps — instead, these falafel were light, airy, vividly green on the inside and shatteringly crisp of skin. I’ve never been to Tel Aviv, but I bet even there, Goldie’s falafel could compete. The good news is that trekking to Philadelphia (or Tel Aviv) isn’t necessary for procuring good falafel. I wasn’t initially convinced, but J. Kenji López-Alt’s recipe on Serious Eats, which I adapted here, changed my mind. Bright with fresh herbs, his falafel achieve that just-so consistency (unlike many recipes, he skips adding flour or any other binding agents, which prevents them from becoming claggy and dense). While the falafel I ate at Goldie were washed down with one of the restaurant’s equally irresistible tehina shakes, I’ve opted to pair mine with Abbeydale Brewery’s Huckster New England IPA. The Sheffield-based brewery has attracted a good deal of hype for this hazy, aromatic IPA. And deservedly so: it’s sweet, lightly creamy in the mouth, redolent of stone fruit and has an appealing snap of bitterness in the finish. The bright, fresh herbs in this dish — basil, parsley, mint, coriander — are lovely alongside this peach of a beer. Up the ante with an extra dose of herbaceousness, courtesy a green tahini sauce and a salad of equal parts diced tomato, cucumber and aromatic nectarine. Altogether, you have a pairing tailor-made for the abundance and sun of late summer. 1. The night before you plan to cook the falafel, add the chickpeas to a large bowl and fill all the way to the top with water. Leave to soak overnight. 2. The next day, drain and rinse the chickpeas. Spread out across several paper towels and place more paper towels on top. Gently roll the chickpeas and pat to thoroughly dry. 3. As the chickpeas dry, make the green tahini sauce. Add the parsley, tahini, lemon juice, garlic, and salt, and blend on low to combine. Turn the motor to high and pour in the ice water in a slow but steady stream. Blend for an additional minute; the sauce should be uniformly green and just thin enough to be pourable. Transfer to a bowl and clean out your food processor. 4. Next, make the falafel. To the cleaned food processor, add the chickpeas alongside the fresh herbs, garlic, salt, spices, and spring onions. Blend on low for 2-3 minutes, pausing to scrape down the sides with a spatula if necessary. The falafel mixture is ready when the ingredients are very finely minced, and when a small spoonful just holds together in a ball. If the falafel mixture isn’t sticking together, blend for an additional 20 seconds at a time until it has the right consistency. Transfer to a bowl, cover and chill for 20-30 minutes. 5. Meanwhile, start preparing the salad. Core the tomato and finely dice. Halve the nectarine, remove the pit and finely dice. Peel and seed the cucumber and finely dice. Add all three ingredients to a sieve. Top with the sea salt and pepper and toss lightly. Leave to drain over a bowl. 6. Once the falafel mixture has chilled, remove from the fridge. Using a tablespoon measure, scoop a golf-ball-sized mound and gently compact it (you can do this while the mixture is still in the spoon, to help shape it). Gently transfer to a plate. Repeat with the remaining mixture; you should have approximately 18 falafel balls. 7. When you’re ready to fry the falafel, fill a cast-iron skillet with the vegetable oil; it should come to approximately ¾-inch up the pan (if not, add additional). Place over high heat. Meanwhile, line a baking sheet with paper towels and place a wire rack on top. 8. Check the temperature of the oil with a deep-fat frying thermometer. Once it reaches 165° Celsius, carefully add half the falafel with a fork, ensuring they’re evenly spaced out; the oil will start bubbling rapidly, so take care. Cook for approximately 3-3 ½ minutes, using tongs to flip and rotate the falafel, until they’re evenly golden-brown on the outside, but the crust is still thin enough to be crisp. Transfer to the cooling rack. Check the temperature of the oil; once it is at the right temperature, repeat with the second batch of falafel. Remove the pan from the heat and set aside to cool before cleaning. 9. While the falafel cooks, lightly toast the pita in a toaster or using your oven’s broiler (grill) setting. Lightly press the salad mixture with the back of a spoon to squeeze out any excess liquid, transfer to a bowl, add the sumac and mix to combine. 10. When ready to serve, slice off the top ¼ of each pita and gently separate the bread layers so the pita forms a pocket. Line each pita with basil leaves and add 4 falafel and several tablespoons of the salad mixture. Drizzle over the green tahini sauce and serve immediately. There are some dishes it’s worth turning on your oven for, even in the height of summer. Tachin is one of them. I first tried, and loved, tachin - a Persian dish of baked saffron rice, layered with stewed chicken—several years ago. Recently, a recipe in Bon Appétit encouraged me to try making it myself. Tachin really is a showstopper of a dish. Made sunny-yellow with copious quantities of saffron, featuring braised chicken and tart barberries, it’s baked until its outside turn crisp and burnished (that crunchy layer of rice, known as tahdig, is completely irresistible). It does require effort, but the feat of having pulled it off makes it all worthwhile. Whiplash has been brewing remarkable beers for a while now, and Clap Hands, the Irish brewery’s American wheat beer, is no exception. Lively and bright, with the big, fluffy head that you’d expect from the style, Clap Hands is also abundantly hopped with Mosaic, El Dorado, and Lemondrop. That lends it a bold apricot character, plus a touch of tropical sweetness. It pairs seamlessly with the hearty and rich tachin, and complements its saffron perfume beautifully. 1. First, cook the chicken. In a large saucepan with a lid, add the whole chicken pieces, plus the onion, garlic, spices, and sea salt. Cover with cold water. Transfer the saucepan to the stove and place over high heat. Once boiling, cover and turn the heat down to a simmer. Cook for approximately 40 minutes, or until the chicken is beginning to fall apart. 2. When the chicken is fully cooked, transfer the pieces to a cutting board and leave until cool enough to handle. Meanwhile, pour out all but half a cup of liquid from the saucepan (save the stock for another use in lieu of discarding). Remove the skin from the chicken and shred the meat, using your hands or a fork. Transfer the shredded meat back to the pot with the liquid, and stir to combine. Place over low heat and cook until the mixture is soft and stew-like but not watery, stirring occasionally to prevent it burning. Taste for seasoning and adjust if needed. Remove from the heat and set aside. 3. Meanwhile, prepare the rice. Add to a sieve and rinse under lukewarm, running water for 2-3 minutes, or until the starch has washed away and the water is clear. Fill a large, lidded saucepan with water and bring to the boil. Add generous amounts of salt: you want it to be as salty as the sea. Add the rice and cook for approximately 6 minutes, or until it is tender but not fully cooked, and still has a bit of bite in the middle. Drain the rice. Rinse with cold water, and drain again. 4. Crumble the saffron threads between your fingers and add to a ramekin or small bowl. Add the hot water and stir. Leave to infuse for 10 minutes. Meanwhile, preheat the oven to 205° C.
5. In a large bowl, add the egg yolks, Greek yoghurt, vegetable oil and the saffron mixture, and whisk until smooth and uniform. Taste the drained rice; if it could use some seasoning, add between ½-1 teaspoon of sea salt to the yoghurt mixture, and whisk through. Add the rice to the yoghurt mixture and, using a spatula, fold until evenly coated. Be gentle, as you want the rice grains to remain whole. 6. Grease a large bowl, baking tray, or cake dish - preferably Pyrex, as that lets you see the colour of the rice as it cooks - lightly with vegetable oil. Add half the rice and gently compact into a flat layer. Add the stewed chicken in a single layer, leaving a small margin around the edge, and then top with the remaining rice, patting flat into a compact layer. 7. Cover tightly with foil. Bake for between 1 hour-1 hour and 15 mins; your cooking time will vary depending on the shape of the bowl or tray you use. Begin to check after 1 hour; the tachin is ready when the rice around the edges and bottom is deep golden- brown. 8. Once the tachin is fully cooked, remove from the oven and leave to cool for five minutes. Meanwhile, make the barberry topping. Add the butter to a small frying pan and place over medium-high heat; once it melts, add the berries, and cook for 3-4 minutes. Remove from the heat. 9. To serve, remove the foil and place a large serving plate on the top of the tachin. Using oven mitts, carefully flip so the tachin is inverted onto the serving plate. Top with the barberries and butter. Slice and serve with a dollop of Greek yoghurt, if preferred. Claire M. Bullen is a professional food and travel writer, a beerhound and an all-around lover of tasty things. Follow her on Twitter at @clairembullen, and pick up a can of Whiplash Clap Hands American Wheat in store or online. If I could only pick one beer to pair with food for the rest of time, I’d probably go with Brattish – a recent collaboration between Beavertown and Belgium’s De La Senne (and unfortunately for my purposes, only a limited-edition brew). Billed as an “Anglo-Belge Pale Ale”, this summery beer is all fruity esters on the nose, thanks to its Belgian ale yeast strain. On the palate, it’s still fresh and delicately sweet, but the lingering snap of bitterness makes Brattish exceptionally balanced and versatile. You could serve innumerable dishes with a beer as food-friendly as this one, but I opted for fried chicken goujons. In my opinion, they’re one of the most miraculous things you can cook at home – partly because they’re really just an adultified version of the chicken nuggets you loved so much as a kid, and partly because they’re really, truly not difficult to make. If you’re the type who quails at the idea of frying anything, know that these are shallow- rather than deep-fried, and cook for just a few minutes: crispy, crunchy, tender, flavourful fried chicken can be yours in no time at all. To add another dimension, the chicken fillets are also marinated in an Indian-spiced yoghurt mixture, similar to what you’d use if you were making chicken tikka. Serve cooling raita on the side, plus an additional dollop of hot sauce or chutney, if you’d prefer. 1. Begin marinating the chicken several hours before you plan to cook. In a medium- sized bowl, add the yoghurt, garlic, ginger, chilli, spices and ½ teaspoon sea salt. Stir well to mix. Add the chicken fillets and mix with a spoon or your hands to ensure they’re well coated. Cover and leave to marinate for at least two hours, or up to overnight. 2. Prepare the raita. Add all the ingredients to a bowl and mix well to combine. Set aside. 3. When the chicken is done marinating, remove from the fridge. Prepare your batter assembly line. Fill one bowl with flour and the remaining ½ teaspoon of sea salt, whisking to combine. Fill the second bowl with the beaten eggs and the third bowl with the panko crumbs, and set out a large plate at the end. Remove one fillet from the yoghurt, shaking off any excess marinade, and dip into the flour. Toss and flip to evenly coat, and shake off any excess. Quickly dredge the fillet in the egg mixture, coating on both sides, and let any excess egg drip off. Finally, place it in the bowl with the panko crumbs and toss until well coated. Place the battered fillet on the plate and repeat with the rest. 4. When all the fillets are battered, add the vegetable oil to a large frying pan, preferably cast iron, and place over high heat. Heat for 5-7 minutes, or until the oil temperature reaches 180°C/350°F on a deep-frying thermometer. Carefully add half of the chicken fillets; they should sizzle rapidly. Cook, rotating and flipping the pieces with tongs frequently, for 3-5 minutes, or until the chicken is crisp and deep golden-brown. You can check that the chicken is cooked through by removing one fillet and slicing into it; the meat inside should be opaque, tender, and flaky. 5. When the chicken is cooked through, transfer to a paper towel-lined plate and leave to cool for 5 minutes. Repeat with the second batch. 6. Serve the chicken while it’s still warm, alongside the raita and additional hot sauce or chutney, if you prefer. Claire M. Bullen is a professional food and travel writer, a beerhound and an all-around lover of tasty things. Follow her on Twitter at @clairembullen, and pick up a can of Brattish while you can, in store or online. The arrival of spring means rain showers and growing things, but in beer circles, it also means bock. German bockbiers—which you’ll recognise because their labels are almost always festooned with prancing goats—are traditionally released in the spring after having been brewed and lagered during the cold winter months. Many beer drinkers are probably familiar with rich, malty doppelbocks, but helles bocks (also known as heller bocks or maibocks) are also worth your while. Reasonably strong but paler in colour than your average doppelbock, these beers are less malt-driven and have a stronger hop presence than their darker cousins. Brewed with bottom-fermenting yeast, Reutberger’s example of the style is a tawny-hued lager with brilliant clarity. It brings mellow sweetness rather than lingering bitterness—its finish is all toffee and caramel, courtesy of its 50-50 split of light and dark malts. apricot glaze. Rather than being oversweet, the glaze adds fruitiness and complexity that marry well with the pork while picking up the toffee notes in the beer beautifully. To tie it all together, I added labneh (Greek yoghurt’s tangy, cheese-like cousin), fruity Aleppo pepper flakes, peppery rocket and fresh mint. Throw the lot together on whatever flatbread you fancy, and wrap it up in foil: this isn’t one for the forks and knives. the seasoning, place a teaspoon-sized amount of the pork mix on a plate and microwave for 20 seconds. Taste and adjust accordingly. Place the pork mix in the fridge and leave to chill for 1 hour. 2. Remove the skewers from the water and pat to dry. Line a baking sheet with foil and place a wire rack on top of it. Wet a paper towel with vegetable oil and grease the wire rack, so the koftas won’t stick. 3. Remove the pork mixture from the fridge and divide it into two. Set one half aside and divide the other into four even portions. Take one portion and pat it until it’s slightly flattened and rectangular. Place a skewer in the middle and shape the meat around it. Gently roll and compress the meat with your hands until it is a roughly 7–8-inch log, with the skewer running evenly through the length of it. Place on the wire rack-fitted baking sheet. Repeat with the three other portions, and then with the remaining half of the pork. Place the whole tray of koftas in the fridge and leave to chill for roughly 45 minutes. 4. Heat the grill/broiler on your oven to medium-high. Place the kofta tray in for approximately 5-7 minutes, or until the tops have darkened in colour. Remove and flip the skewers over and return to the grill/broiler and cook for 5-7 minutes more. 5. As the koftas are cooking, make your apricot glaze. Add all five ingredients to a small saucepan and heat over medium-high heat until the mixture comes to a boil. Reduce to medium heat and cook down for 2-3 more minutes, or until the glaze is syrupy and very thick. Remove from the heat and pour into a small bowl or ramekin. 6. Once the koftas have darkened on both sides, remove from the oven. Use a pastry brush to brush the glaze on one side of the koftas and return to the grill for 2-3 minutes, or until they’re starting to look browned and caramelised. Flip the skewers, brush with the rest of the glaze, and cook for 2-3 minutes more. to prevent any leaks. Serve immediately. Claire M. Bullen is a professional food and travel writer, a beerhound and an all-around lover of tasty things. Follow her on Twitter at @clairembullen, and pick up a bottle of Reutberger Josefi Bock while you can. Wings are, in many ways, the perfect food. Crispy and juicy when done right, they offer the messy, almost carnal satisfaction of eating with your hands, of failing to care that your face is smeared with sauce and grease. Not a pretty experience, and all the better for it. Much as I love classic Buffalo wings, I wanted to serve a different iteration alongside Elusive Brewing and Hop Burns & Black’s collaboration smoked porter, Aztec Challenge. Brewed with smoked cherry wood malt, pequin chiles, and scotch bonnet peppers, its kindled heat is tempered by a rich, almost sticky sweetness. These wings respond in turn. Their sauce riffs on a Sam Sifton recipe for baked Trini-Chinese chicken, and combines Caribbean flavours - potent scotch bonnet hot sauce, the brightness of lime juice - with Chinese ingredients like oyster sauce, soya sauce, and anise-scented five-spice powder. The wings themselves, made using J. Kenji López-Alt’s tried-and- true double-fry method, are shatteringly crisp underneath that slick of sauce. Sweet, spicy, and umami-laced, they’re just what this beer deserves. You’ll be frying the wings twice; for the first fry, add the oil and prepared wings to a deep, heavy-bottomed pan and place over medium-high heat. Use an instant-read thermometer to monitor the temperature; you’ll want to raise the heat to between 107-121 degrees C. Cook the wings, stirring and flipping occasionally, until tender and just cooked through, but not golden on the outside, roughly 15-20 minutes. Remove with tongs or a spider-style strainer to a baking sheet fitted with a wire rack and lined with paper towels. Let rest an hour at room temperature or covered in the fridge overnight. When ready to do your second fry, heat the oil to 205 degrees C and remove your chicken from the fridge. While it’s heating up, prep the sauce: place a small saucepan over medium heat and add the butter. Once melted, add the garlic and ginger and stir frequently until the raw flavour and aroma has dissipated and the mixture is starting to brown, 3-5 minutes. Next, add the five-spice powder and stir quickly to toast before adding the oyster sauce, dark brown sugar, lime juice, soya sauce, and hot sauce. Turn heat to low and cook until just warmed through, stirring frequently. Remove from the heat and set aside. Once the oil is at temperature, carefully add the chicken pieces with tongs to avoid splattering. Stir to make sure they’re not sticking to each other or the bottom of the pot. Cook, keeping the oil temperature ideally between 190-200 degrees (it will drop when the wings are added) for roughly 10 minutes, or until the wings are crispy and golden. Remove from the oil to the wire rack and let rest for a moment. Pour your sauce into a large bowl and add the wings. Toss well until all pieces are well coated. Serve in a bowl, topped with sliced spring onion and toasted sesame seeds. Claire M. Bullen is a professional food and travel writer, a beerhound and an all-around lover of tasty things. Follow her on Twitter at @clairembullen, and pick up a bottle of our Elusive collab Aztec Challenge while you can. lemony sorrel (the latter an early signifier of spring). What you get is a salad of enormous punch and vigour. The radicchio brings a bass note of bitterness, the blood oranges a dose of acid, the shallots a burnt caramel sweetness and then, of course, the centrepiece duck, crispy of skin and richly gamey. This is no wan, wilting plate of greens, and so it makes sense to pair it with 8 Wired's Saison Sauvin. This New Zealand saison is a regular in my rotation. Made with, as its name suggests, Nelson Sauvin hops, it's floral and estery on the nose, vinous on the palate and leaves a railing, pithy bitterness in its wake. It’s everything I want from a dinnertime beer: complex enough that you’re tempted to pause after every sip to parse out its tasting notes, but also utterly drinkable. It stands up ably to the salad’s bold flavours, and tastes slightly sweeter besides it. Just one note of warning: as some industry experts might say, this beer has the potential to be a foamy hello-er, so you may want to open it over the sink and have a glass at the ready! Slice your shallots in half, length-wise, and peel. Place cut-sides up on a lined baking sheet and drizzle with the balsamic reduction. Sprinkle lightly with sea salt and roast for 15-20 minutes, or until softened, fragrant, and starting to caramelise. Meanwhile, in a small, dry frying pan, toast the walnuts over medium-high heat for approximately 5 minutes, or until darkened and fragrant. Set aside and allow to cool. Roughly chop. you're not familiar with the technique, this is a good visual demonstration. Now, it's time to prepare the duck. Heat a medium, heavy-bottomed frying pan over high heat until hot. Add the duck breasts skin-side down and cook for approximately 6 minutes; you don't need to add any oil as the fat will render out. As the fat renders, keep a small bowl and a spoon at hand, and spoon out the excess (you can save this for later—it's brilliant on roast potatoes). Check how the skin is doing; once it's deep golden and crisp, flip the breasts over, turn the heat down to medium, and cook for 3-4 more minutes. Remove to a cutting board and let rest for 5-10 minutes. As the duck rests, prepare the dressing: add the ginger, vinegar, blood orange juice, mustard, and olive oil to a small bowl and whisk. Season to taste with salt and pepper and whisk again. To serve, slice the duck thinly. On your plates, arrange the radicchio and sorrel. Top with the blood orange segments and walnuts; roughly separate the shallots and scatter across the salad. Arrange your duck slices over the top, and then pour over the dressing. Season to taste with a bit more salt and pepper. Claire M. Bullen is a professional food and travel writer, a beerhound and an all-around lover of tasty things. Follow her on Twitter at @clairembullen, and pick up a bottle of 8 Wired Saison Sauvin in store or online. I came up with this recipe when seeking a use for almost-but-not-quite-ripe persimmons (when fully ready, they redden, turn heavy with juice, and look almost bruised). I used hachiya persimmons, which are tall and heart-shaped, where fuyu persimmons are squatter and more tomato-like; hachiyas also happen to be astringently tannic when unripe. To guarantee their sweetness, I sliced the fruit thinly and fried it lightly in butter, until the former caramelised and the latter browned. Though this dish feints towards warmer weather, with its caprese-esque pairing of basil and burrata, the brown-butter fried persimmon, Prosciutto and brown sugar-candied walnuts confirm its wintry origins. I love it for its ease, for its quick dose of February sun, and for the fact that it can be eaten for breakfast, lunch, or dinner. Just as this toast is an anytime dish, so Track's Sonoma Pale Ale is an anytime beer. At just 3.8% ABV, it's sessionable and refreshing, though its hop bill makes for an herbaceous, grassy complexity, with a bit of citrus on the nose. It's one guaranteed food-friendly beer, and pairs seamlessly here. Next, use a paring knife to remove the top of the persimmon. Slice the fruit thinly, into roughly quarter-inch slices. Heat the remaining 30g of butter in a large frying pan over medium-high heat. As soon as the butter has melted, add the persimmon slices in a single layer. Cook approximately 2-3 minutes per side. When finished, they should be softened, lightly caramelised, and the butter should have turned nut-brown. Remove from the heat and set aside. Slice two thick pieces of sourdough, and toast until golden. Top each piece with a generous glop of burrata, spreading it to the edges. Sprinkle the candied walnuts across both pieces, and top with the persimmon slices. Arrange the prosciutto around the fruit, and drizzle extra brown butter from the pan across both slices. Finish with a few bright basil leaves and a twist or two of black pepper. Claire M. Bullen is a professional food and travel writer, a beerhound and an all-around lover of tasty things. Follow her on Twitter at @clairembullen, and pick up a bottle of Track Sonoma in store or online. This Saturday 24 Feb, come meet the Track team in store from 2-4pm. From New York bagels to char-dappled Neapolitan pizzas to, duh, beer, my relationship with bread and grain-based products remains one of the longest and happiest of my life. You can trust me, then, when I say that you don’t have to be gluten-free to appreciate Burnt Mill’s Steel Cut Oat Pale Ale. Made with oats, buckwheat, maize and sorghum, and then dry-hopped, this beer is an astonishingly good gluten-free rendition - so good, in fact, that I’d bet many blind tasters wouldn’t notice the difference. Given that Burnt Mill’s talented Head Brewer Sophie de Ronde is herself gluten-intolerant, you can understand the brewery’s motivation to pull off this feat. Bright with hop aromatics and laced with bitterness, Steel Cut is refreshing, food-friendly and - all things considered - remarkably complex. A plateful of gluten-free comfort food is a fitting accompaniment to this beer. I love polenta for its optics - it looks like spilled sunshine on the plate - its ease and its sheer versatility. Top it with browned mushrooms (which pick up on the Steel Cut’s subtle, savoury edge), curls of Beaufort (an Alpine cheese that should appeal to fans of Gruyère), a sprinkling of thyme and a soft-boiled duck egg, its yolk like molten copper. You don’t have to be a coeliac to appreciate a dish like this - but if you are, it’s hard to find more satisfying stuff to help ward off the winter blues. First, prep the polenta. Heat the broth in a medium saucepan until just boiling. Add the polenta in a steady stream, whisking continuously, to prevent it from clumping. Stir frequently until the mixture thickens, roughly 3-5 minutes. I prefer a more porridgey consistency; if you do too, add several more tablespoons of broth until the mixture is slightly looser. Add 30g of the butter and the Parmigiano, stirring well to combine, and season to taste with sea salt. Cover and set aside. Next, prepare the mushrooms. Take a cast-iron or other heavy bottomed pan and heat on high until very hot. Add 30g of the butter and, as soon as it melts, add half of the mushrooms and the garlic. Try not to agitate them too much, as you want them to get golden and caramelised. Cook for several minutes, tossing occasionally; remove from heat and scatter over the thyme leaves. Season with sea salt and black pepper to taste. Repeat with the second batch of mushrooms and the remaining butter. Finally, prepare the duck eggs. Bring a small pot of water to the boil and cook the duck eggs for six and a half minutes, or until perfectly soft-boiled. Remove from the pot and place in a bowl full of ice water for 30 seconds. Carefully peel and slice in half. Ladle the polenta onto each plate and top with the mushrooms. Garnish with the slices of Beaufort, extra thyme leaves, and the duck eggs. Serve immediately. Claire M. Bullen is a professional food and travel writer, a beerhound and an all-around lover of tasty things. Follow her on Twitter at @clairembullen, and pick up a can of Burnt Mill Gluten Free Pale Ale while you still can. As I write this, it's lightly snowing. For the first time in nearly five years, London has softened, stilled. There are many productive ways to spend such a rare, wintry Sunday; for my money, preparing chocolate truffles has to be one of the best. Making ganache - the truffles’ base - is a sensory thing, almost overwhelmingly so. It’s good to do when everything else is cold and quiet, and the process can hold all of your focus - not because it’s especially difficult, but because it is enormously pleasurable. You snap shards of chocolate and then watch them collapse into velvet darkness. Every spatula swirl sends up perfume. You mix the melted chocolate with warm cream and let the mixture gloss and chill until it's firm enough to work with (maybe you even squidge the bowl directly into a bit of slushy snow outside so it sets more quickly). Then you scoop out teaspoons of the set ganache and roll it into spheres, quickly, between your warming palms. To finish, you can dust your proto-truffles with cocoa powder, or dip them into a bath of melted chocolate to coat - or you can use both methods, as I did. These truffles were inspired by Black: one of three fantastic collaboration beers made in honour of Hop Burns & Black’s third birthday. This one, brewed with Peckham's Brick Brewery, is a beautiful, inky stout. Additions of blueberry, vanilla, and lactose have all added to its dessert-like profile, though its roasty, bitter finish makes it moreish rather than cloying. To match it, the truffles are infused with blueberry jam, a dash of cinnamon and vanilla. This recipe makes enough truffles so that you might make gifts of them and still have a plate left to yourself. I’d recommend ferrying it to the cosiest corner of your flat, cracking open a fresh can of Black and watching the snow come down. First, place the blueberry jam in a small saucepan. Heat over medium-low heat until it is warm and mostly liquid. Add the cinnamon and stir well to combine. Remove from heat and let cool for 30 seconds; blend, using an immersion blender or a regular blender, to break down any whole berries in the jam. Set aside. In a saucepan, add the double cream and the light brown sugar and warm over medium-high heat. Stir well to combine and bring the mixture to a gentle boil. Boil for approximately one minute, stirring frequently so it doesn't scorch on the bottom. Remove from heat and let stand for one minute. Add the vanilla bean paste and stir to combine. In a large, heatproof bowl, break up the dark chocolate into small pieces. Pour over the double cream and the liquefied blueberry jam (note: you may need to return the jam to the stove on low heat for a minute so that it's pourable, as it will quickly solidify). Stir well until the chocolate is all melted. Whisk to remove any lumps. Cover and chill for at least two hours, or until the ganache has set. Once the ganache is firm enough to work with, start to roll your truffles. With a teaspoon, scoop out a small amount of ganache and delicately and quickly roll between your palms until it forms an even sphere. Place on a baking sheet lined with parchment paper and repeat. You'll want to do this as quickly as possible so the ganache doesn't soften too much; it may start melting in your hands, in which case you should pause to wash and dry them well. for another 30 minutes to help set. Now, you’re ready to finish preparing your truffles. To make the truffles that are coated in a dark chocolate shell, you'll need a thermometer to ensure the melted chocolate is properly tempered (otherwise, it will turn blotchy or chalky as it cools). First, prepare a double boiler: heat a saucepan of water until simmering and place a second bowl on top of the pan (it should fit neatly, so there are no gaps, but its bottom should not touch the water). Add two-thirds of your chocolate and stir constantly until it's completely melted. Remove the bowl from the pot of water. Add the rest of the chocolate and stir until melted. Check the melted chocolate from time to time with a thermometer; you want to let it cool until it reaches 31-32 degrees C (88-90 degrees F)—mine took approximately 10 minutes to drop to the right temperature. Once it is at temperature, add one ganache ball and toss quickly with a fork until evenly coated in chocolate; remove to a plate lined with parchment paper. Repeat until roughly half of your truffles have been coated with chocolate (if the temperature of the melted chocolate drops too much, you may need to quickly reheat it). Leave your truffles to set for 10-15 minutes. To make the truffles that are coated in cocoa powder, put the cocoa powder and cinnamon in a small bowl. With a fork, add one ganache ball at a time, tossing lightly, until evenly coated in the cocoa powder mixture. Set aside, shaking off any excess, and repeat until all have been coated. If you want to use one method over the other, simply double the quantity of the chocolate or the cocoa powder and cinnamon, respectively. Claire M. Bullen is a professional food and travel writer, a beerhound and an all-around lover of tasty things. Follow her on Twitter at @clairembullen, and pick up a can or two of Brick x HB&B Black while you still can. If you missed the chance to get your hands on Cantillon’s latest Fou’Foune release, don’t fret: just pick up a bottle of The Kernel’s Bière de Saison Apricot instead. It isn’t hyperbole—this is a truly exquisite, albeit underrated beer. One of the newest releases from The Kernel’s esteemed barrel-ageing programme, this Bière de Saison is a heady blend of aged and fresh saisons, which sits in the barrel with Bergeron apricots (the very same heritage variety that goes into Fou’Foune) for approximately six months. It’s elegant, tart, bright with apricot and lemon notes and undergirded by yeasty complexity. Given how well cheese and saison go together, I wanted to explore that pairing here. But—to complement this beer’s beautiful apricot character—I wanted a lightness and delicacy, too. So I settled on this sweet and savoury phyllo pie: it’s flaky, gooey with cheese, but also drizzled with honey, perfumed with rosewater, and topped with crushed pistachios. Think of this recipe as a combination of Old Rag Pie (a Greek recipe by way of Nigella Lawson, which is packed with crumbled feta, grated Parmigiano Reggiano, and fresh thyme leaves) and künefe (a cheese pastry that’s soaked in syrup and is eaten for dessert in Turkey, Palestine, and elsewhere across the Levant). Or perhaps categorise it as a Mediterranean cheesecake. Whatever you do—and whether you serve it with a simple side salad for dinner or add extra rose petals and honey for a quasi-dessert—just make sure you’ve got this world-class beer to go with. Preheat the oven to 200 degrees. In a square 8-inch Pyrex baking tray or cake tin, add your first layer of phyllo dough and brush with melted butter (it should overhang the sides). Take two more sheets of phyllo dough and tear them into rough pieces; scrunch loosely and place so that they cover the base layer of dough. Crumble half of the goat cheese and half of the feta over this first layer of scrunched up phyllo. Add half of the thyme leaves, half of the grated Parmigiano, and a good drizzle of melted butter. Now, repeat. Top with two more scrunched layers of torn phyllo. Crumble the remaining goat cheese and feta over, and add the remaining thyme leaves and Parmigiano. Drizzle over with more butter, reserving a small amount. For your last two pieces of phyllo dough, tear in larger sheets and arrange over the top. Fold up any overhanging bits of dough, and pat into place. Drizzle over the remaining butter. Make two lengthwise and two widthwise cuts with the sharp end of a knife. In a medium-sized bowl, whisk together the milk, double cream, eggs, and 1 tsp of the rosewater. Pour evenly over the phyllo layers and allow to soak in for 15 minutes. Top with the pistachios. Place in the oven and bake for 15 minutes, or until puffed and beginning to turn golden on the top. Cover with foil and bake for another 15 minutes. Remove from the oven and let sit and cool slightly for 5-10 minutes. Drizzle over with honey to taste, and the remaining 1 tsp rosewater. Garnish with dried rose petals, if you wish. Serve while warm. Claire M. Bullen is a professional food and travel writer, a beerhound and an all-around lover of tasty things. Follow her on Twitter at @clairembullen, and pick up a bottle of The Kernel's strictly limited Biere de Saison Apricot while you can. From chestnuts to squash, autumn calls forth a bounty of seasonal ingredients that are all the more enticing for their ephemerality. But beyond all the pumpkins, the season’s arrival also heralds a slew of autumnal beers worth seeking out for the few short months that they can be found on the shelves. Case in point: Burning Sky's elegant Saison L'Automne. Made with late-summer blackberries plucked from the wild brambles that surround the brewery, as well as pink peppercorns and grains of paradise, it pours the subtlest shade of blush in the glass. In the mouth, its fruit is subtle, too: a tart blackberry essence is just detectable, while a whisper of pepper rounds out each gulp. Brewed with Burning Sky's house saison yeast, as well as brettanomyces and lactobacillus, the beer has a beautiful complexity now; leave it longer and it’ll only continue to evolve and incline further towards funkiness. I like my saisons paired with cheese, whose richness they're adept at tempering, and what better way to turn cheese into a complete meal than a grilled cheese sandwich (or, for my British brethren, a toastie)? Whatever you prefer to call it, this sandwich is made with two positively unctuous characters—Taleggio and Délice de Bourgogne, an exquisite triple crème cheese—as well as fried sage leaves (an excellent foil to blackberry) and a crunchy hazelnut relish. Fancy enough to impress, but simple enough to make for yourself in 20 short minutes, it offers just the right amount of autumnal decadence—especially with this beer on the side. In a food processor, pulse together all of the ingredients until the hazelnut is finely chopped and the mixture is well combined. Set aside. In a small frying pan, heat the butter over medium-high heat. As soon as it has melted, add the sage leaves in a single layer, making sure they aren't overlapping. Fry for approximately two minutes, or until the leaves have darkened in colour and have crisped. Gently remove from the pan with a fork or slotted spoon, and allow to drain and cool on a paper towel for five minutes. To assemble your sandwiches, first generously butter both sides of each piece of bread with salted butter. On one piece of bread (setting a second aside for the time being), build your sandwich fillings by layering half of the Taleggio and Délice de Bourgogne, topping off with a generous amount of relish and 10 fried sage leaves. Repeat with the second sandwich. Heat a large frying pan over medium-high heat. Once hot, add the two cheese-topped slices, bread-side down, pressing the second pieces of bread onto the top of each once in the pan. Cook on one side for approximately 3-4 minutes, or until the cheese is starting to get gooey and the bottom bread has gone a toasty golden brown; flip your sandwiches carefully and continue to cook on the opposite side for 2-3 more minutes. When done, remove from the pan and let sit for a minute before slicing in half and serving. It’s hard to believe that, a few short weeks ago, we were eating peaches and tomatoes by the bushel. But now that it’s October, there’s a whole new seasonal bounty to be had. and earthy. It's got grouse, pink of breast and deeply meaty, only available in butchers for a few months of the year. The only thing that possibly doesn't quite fit this seasonal picture? The beer. springtime signifier; Ayinger's Celebrator—a superlative example of the style—even comes with a plastic goat charm slung around the bottleneck. Even if doppelbocks are traditionally released in spring, the style's rich flavour profile, molasses-like mouthfeel and heady strength make it ideal to consume during the colder months - especially during Oktoberfest. Call me a rule-breaker, but I think the beer has never been better used than as a pairing partner for this supremely autumnal plate. Fill a bowl with cold water and add the lentils. Rinse by swishing around in the water, and pick through for any stones. Drain and set aside. Add the olive oil to a medium saucepan and heat over medium-high heat. Add the carrot, shallots, and garlic, and, stirring frequently, cook for 5-6 minutes, or until softened and shallots have gone translucent. Next, add the rinsed lentils, the vegetable stock, bay leaves, thyme, and season with salt and pepper. Once the mixture has come to a boil, turn the heat down to low and allow to simmer for approximately 25 minutes, or until the lentils are tender and the broth has mostly been absorbed. Add the chestnuts and cook for 1-2 more minutes. Drain any excess liquid, and season further to taste. Remove the thyme and bay leaves and discard. Prepare the squash. Wash off any dirt off and pat dry. With a very sharp knife, slice off the stem and then slice it in half, carefully (no peeling necessary). Scoop out the seeds and gunk from the cavity and discard (alternatively, you can keep the seeds and roast them later, as you would pumpkin seeds). Slice the squash into approximately inch-thick crescents. Arrange the squash slices on a baking sheet lined with parchment paper. Drizzle over 2 tbs olive oil and season to taste generously with cracked black pepper and flaky sea salt. Add the thyme. With your hands, lightly toss the squash pieces to ensure they're evenly coated. Meanwhile, heat the remaining 2 tbs olive oil in a large skillet over high heat. Your grouse should have come from the butcher with streaky bacon or pork fat covering the breast; remove and set aside. Once the pan is hot, add the grouse, using tongs to brown the birds on each side, approximately 2-4 minutes total. Return the pork fat or bacon to the grouse, and add the birds to the tray with the squash, breast-side up. Season the grouse generally with salt and pepper inside and out. If you have more squash than can fit on the tray—you want it in a single layer, not piled up—move the excess to a second parchment-lined tray. Roast in the oven for 20 minutes, after which the grouse will still be beautifully pink within and your squash should be tender. While the grouse and squash roast, prepare the mace brown butter. In a small frying pan over medium-high heat, melt 50g butter. Let it cook for approximately 4-5 minutes; it will bubble up and will begin to smell toasty and nutty as it cooks. Butter browns quickly, so watch it attentively; as soon as it starts to darken, add the mace and stir to incorporate. Remove from the heat after 30 seconds and allow to cool slightly. To serve, plate up your grouse, your squash and your lentils, and drizzle the mace brown butter over the whole lot. Claire M. Bullen is a professional food and travel writer, a beerhound and an all-around lover of tasty things. Follow her on Twitter at @clairembullen, and pick up a bottle of Ayinger Celebrator while stocks last.